Sleep apnea has caused significant damage to the health of thousands of men and women across the United States, reports pharmacist Marla Ahlgrimm. As Ahlgrimm explains in the following conversation, the problem has become progressively worse in recent years. Q: Why is a good night’s sleep so important for a person’s overall well-being? Marla Ahlgrimm: A proper rest can keep the mind and body as healthy as possible. Most people need six to eight hours of sleep each night, though the exact total depends on the individual. A good night’s sleep has also been associated with weight loss. 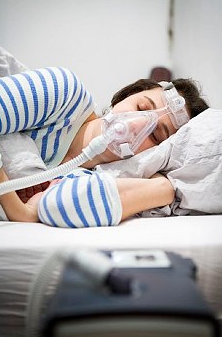 Unfortunately, sleep apnea causes major disruptions in sleep patterns and can lead to serious injury or illness. Q: How many people in the United States are affected by sleep apnea? Marla Ahlgrimm: Among adults aged 30 to 70, sleep apnea is a daily part of life for a whopping 26 percent according to results drawn from the American Journal of Epidemology. Q: What is the definition of sleep apnea? Marla Ahlgrimm: Sleep apnea occurs when a person experiences brief pauses in breathing during sleep. In obstructive sleep apnea, the throat or nose airway becomes completely or partially blocked. Central sleep apnea is when the brainstem has been damaged by stroke, infection or another medical condition. Q: What are the most prominent symptoms of sleep apnea? Marla Ahlgrimm: The symptoms of sleep apnea typically include morning headaches, concentration and memory issues, sore throat, dry mouth, excessive sleeping and loud snoring. In some cases, people experience silent breathing pauses, gasping and choking during sleep. Q: What are the long term health effects of sleep apnea? Marla Ahlgrimm: When left untreated, sleep apnea may result in cardiovascular complications such as cardiac arrhythmias. Sleep apnea influences the brainstem in a number of ways and may change its function and structure. This may result in reduced capabilities that may harm the individual’s career or personal life.